1. Humans: the most common race. This race is found all around the world of Semedia. (Like our own). Physical Description: Males: Are taller and more muscular, as a rule, than their female counterparts. The weigh more as well.Males can grow facial hair. Females: Shorter and slightly weaker (physically)than their male counter parts. Both can have any colored hair, and natural eye color. Abilities:Any that their body allows. *Drow: Descended from the original dark-skinned elven sub-race called the Illyththiiri, the drow were cursed into their present appearance by the good elven deities for following the goddess Lolth down the path to corruption and evil. They are dark skinned like polished obsidian and have red, pink, violet, or silver eyes. They tend to be slightly smaller and thinner than their surface cousins. They posses a unique hand sign language that only they and a few surface elves are able to understand. It is not written and it would take humans at least half their life span to learn it. They can commune with each other from up to 120 ft.
as long as they can see each other (using this hand language). They are able to use racial spells such as Globe of Darkness and Fairy Fire. Alignment tends to be evil. The most common of all the elven races. The are elegant and intelligent. The are known to be found mostly in wooded valleys and forests. 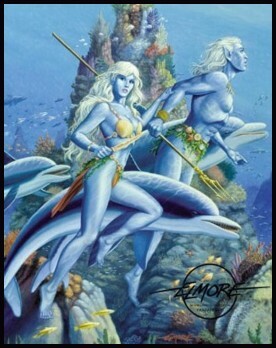 *Aquatic: Known also as water sprites they are smaller in stature to the other elves. They are found in water but occasionally they can use magic to come on land for a limited time. Appearance: Hair tends to be pale to dark blue or green. Eyes tend to be catlike in appearance and can be green, blue, or gold. They have webbed feet and hands. *Wood: Wood elves are known to be savage at times and very fierce they are found in woods or forests. They tend to be tanned compared to the fair skinned valley elves. **Note: All elves but the aquatic elves get an increase in possible sea sickness. All elves are slightly faster and more intelligent than humans and some of the other races, but they are slightly weaker in physical strength. 3. Half elves: Half elves can be a cross of elves and humans, elves and demons, elves and werewolves, elves and vampires, and elves and dragons. Any class. 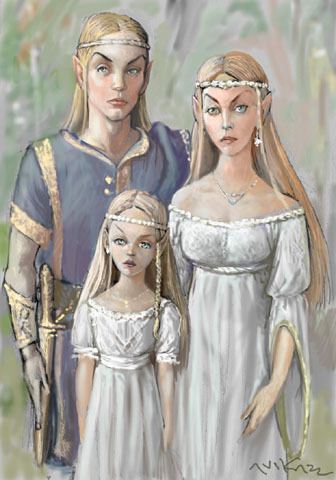 They resemble their elven parentage but are slightly taller and their ears slightly less pointed. They live about half the average age of an elf, and can come from any of the elven races. The tend to be slightly more dexterous than a human and their eyes tend to resemble the elven races. However they are looked upon as outsiders especially by most of the elven race. Occasionally you can find them in an elven society but their rank and influence will be limited. Humans for the most part will except them, if a little grudgingly. 4. Halflings: Small people that tend to resemble children with slightly pointed ears and hairy feet.They usually are rogues, as they tend to be less noticeable and stealthy. If they had a chance between setting in front of a fire and eating all day, to going on a quest they would chose the fire. They tend not to get their hands dirty if they can help it. They tend to be of a well mannered nature and of good or neutral alignment. They take pride as farmers, gardeners, or barkeeps and tend to be a peaceful folk. they posses a weakened form of night sight. *Surface: Hardy mountain folk.They are into mining precious metals and gems. 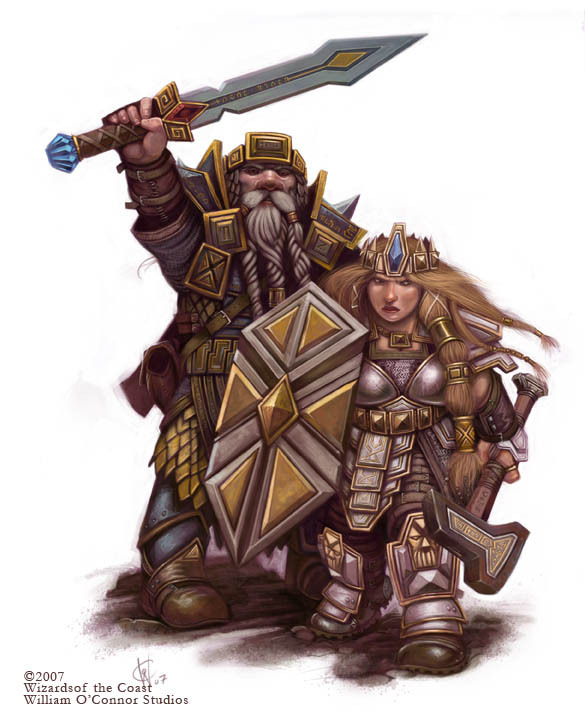 They are small and thick of stature, and they are usually warriors, they tend to have a greater strength than most other races.Occasionally they will have priests or magic users in their race too. They tend to have a problem getting along with elves seeing them as being more fey and light spirited. Surface dwarves can range from any alignment though usually they maintain a good or neutral alignment. When it comes to drinking Dwarves can hold their ale remarkably well.It takes quite a bit of ale to get a Dwarf drunk. 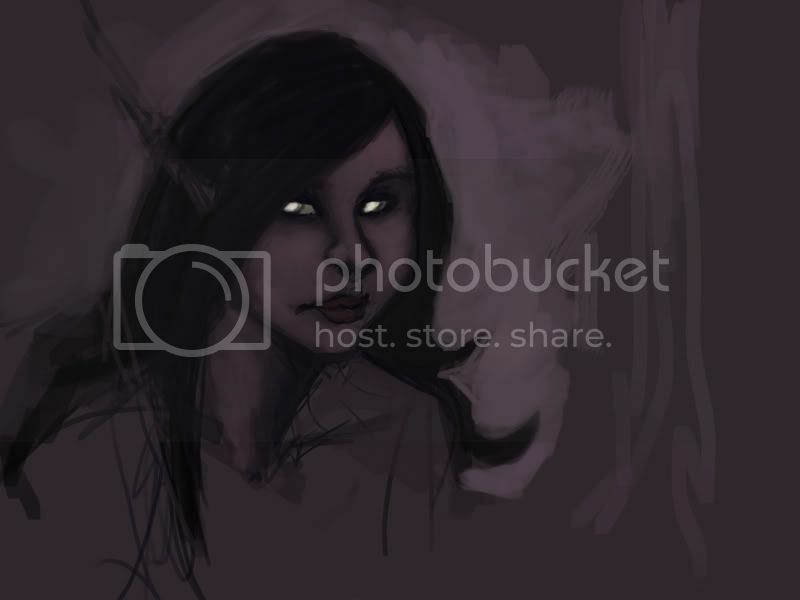 Duarger are usually evil, and tend to be found in the underdark. Like their surface cousins they tend to have a problem getting along with elves, however, they tend to kill the Drow to prove their hatred. They are darker in appearance to their surface cousins, and tend to have pale almost milky white eyes. They will kill their surface cousins if given a chance. They tend to be warriors but their priests and magic users posses shadow magic when they take the profession. 6. Half dragons: Can be mixed with any race (very rare for them to be mixed with Lycanthrope or demon. They are usually temperamental and easy to displease. They never forget an enemy or friend, and are hard to make friends with. They can be any class and any alignment. Some maintain a scaled appearance, others wings. Occasionally there will be some that look purely like the race of their non dragon parent. They are found all over the world, were ever dragons are. *Werewolves: Any class and alignment. There are four major clans of the werewolf, each with their own abilities. The Wild Clan: They tend to be wild and ferocious, due to their nature, and are the best warriors of the werewolf clans. 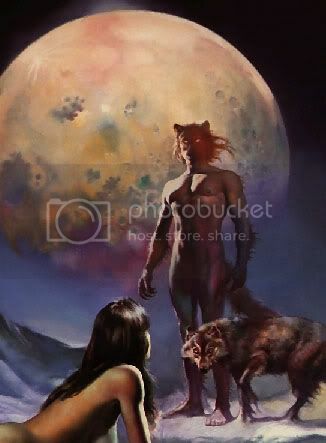 They are most dangerous in the wild, where they are more at home and are possessed with the ability to commune and even ally themselves with carnivorous animals, and are often accompanied by a large wolf or dog even in human form. They are, however, weakened or may even die if they are caged or kept in cities for long periods of time. Races that can be effected by their "venom": Humans, elves, half elves, Shathary, and occasionally Szarliks. *The Society Clan: These werewolves are at home in both the city and the wild. They are diplomatic and very charismatic. They hardly ever turn unless provoked. They are very civil and often pass themselves off as humans, some have even entered government. Due to their close association with humans they are often hunted by their own kind. *The Spell Casters Clan: This clan is more educated in the arcane, and they are the most powerful spell casters of all the clans. They have been known to use more shadow magic than any other. They are able to live in both the city and the wild, but often feel caged if in a city for long periods of time. They are often hunted due to their magical abilities. *The Survivor Clan: They often stay near cities or well traveled roads. They are the best thieves and Assassins to ever appear in the clans. The assassins often use shadow magic to help achieve their goals at killing their target. They also make excellent spies. White magic is often their weakness, as well as their own kind. Werecats: Any alignment and class. They can turn into any type of large hunting cat, ranging from tiger to panther. Unlike werewolves they change every night, and are immune to silver. They can be killed using gold blades. Characteristics: They tend to be slightly larger than normal cats and they maintain the same eys color as they would in human form. Unlike the werewolves they tend to be more wild in nature, and very rarely will venture into human habitats. Werefoxes are mysterious creatures. They tend to be mischievous and cunning. They tend to target rogues. Any race but demon can be affected by them. Able to change at will. Were Rats: These lycanthropes turn into large rats the size of men. They are usually found in sewers or graveyards, and catacombs. They turn once every week and can be killed by magical blades. They turn people by their bite or scratch, however there is a chance they will poison them and not turn the. The were rat tends to carry diseases so there is a chance their opponents will be effected. They are most all ways evil, and tend to be very fast and sneaky. They make great rogues or assassins and tend to stay in groups ranging from two to six. Wereravens are mischievous like the werefox and tend to be attracted to shiny objects. They have keen eyesight and are able to change at will. Any race but demon and dragon can be affected. 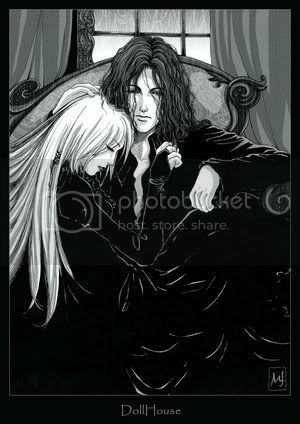 *Vampires, or Vampyre as some say: Though usually evil they can be any class alignment. They can be any class but clerical as holly objects and water effect them. They can be killed in the traditional way. 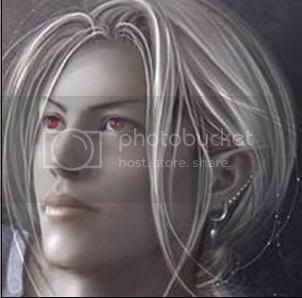 However they can go out into day light, but they lose any vampire abilities and become little more than human or elf (depending on the race they were when turned. Night Sight (they have already). And more (ask story master). They are able to turn others by draining them off blood and giving their blood in return. Can only turn human, elves, halve elves, and rarely half dragons. Alignment: Usually evil but some have been known that are good or neutral. *Fire: Fire demons can take the form of a human or elf, they are quiet large in natural form and have wings enabling them to fly. The have spells based in fire and electricity, and can be summoned through rituals of flame. Alignment: Usually evil, though there have been exceptions. *Water: Tend to stay near bodies of water, there kind includes Sirens, and will'owhisps. It is unclear how they came to be on Semedia. Weaknesses: Light, good, and being kept from water. Alignment:Evil small percentage of good. *Air: They tend to be trouble makers and rebels by nature, even defying the demon court. They control the air element. 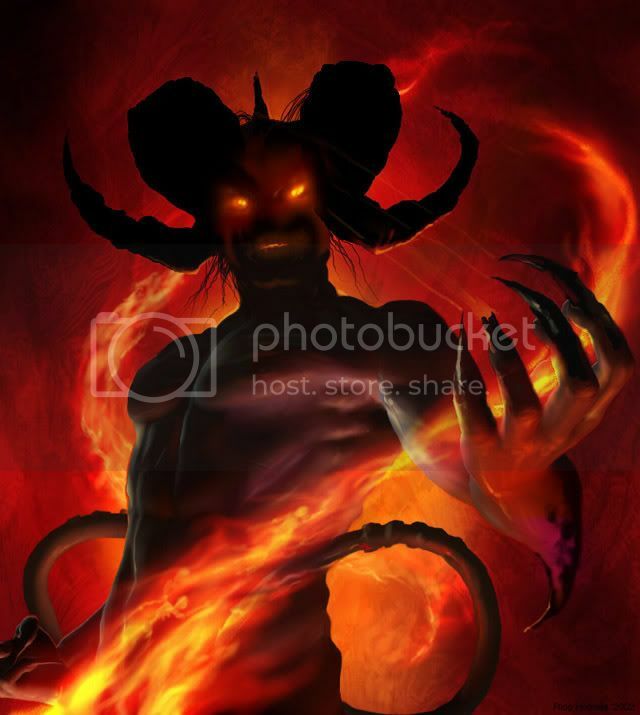 They despise the other demons as a rule and believe themselves better due to their more human natural appearance. *Earth: These demons control the element of earth. And are actually protective of it. No one is sure of their alignment, but some have worked with druids. Note: these pictures resemble what they look like in natural form, they don't always appear that way. 9. Half demons: These offspring come from any race and a demon parent. It is rare but has occurred, that one of the parents is a god. They are often times shunned and caste from society in fear. 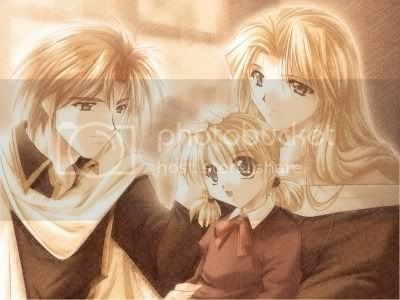 They have various powers depending on what type of demon the one parent was. They can be any alignment and any class, though the are often known as loners. Looks: They tend to have gold, red, or silver eyes, in a lesser degree they will have streaks or specks of any of those colors. Their hair can be any color. 10. Azca: A winged humanoid that uses magic, they have large gold or silver eyes. Their magic is usually used to aid people but there have been cases where they have used it to destroy. 11. Gnomes can be any alignment, but usually neutral. Usually found in rocky hills or builder strewn forests. The have night sight and are distantly related to the dwarven race. They are only able to be a rogue,assassin, magic user, or thief, they may combine two of them as well. If they are fighters they will not be as strong as some other opponents, however they tend to be more cunning. They are usually very talented and intelligent. They are gifted at inventions. 12. 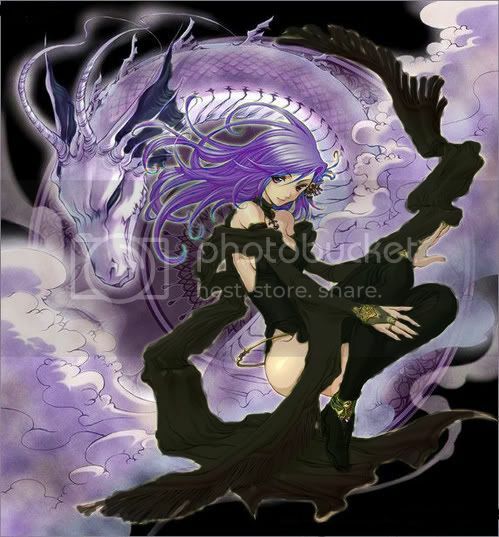 Kaeko are strange creatures are possessed with the abilities to see into another's mind or even soul. They can be deadly with such knowledge. They are rare and usually appear as various humanoids. No one knows for sure what their true form is. 13.Hiates are Orc-like creatures that have greater intelligence then that of their cousins. They can range from good to evil and are sometimes confused with orcs. Physical Description: Resembles that of the orc, except they are slightly less grotesque. Nature: Friendly or hostile depending on alignment. 14.The Szarlik are a race of evil creatures they were originally made to be foot soldiers for a secret clan that thought to take the underdark by storm. The clansmen who created the szarlik trained them to be ruthless fighters but the clansman Unlak was a man of literature and didn't want the soldiers to be idiots like so many other races commonly used for fodder. He wanted them to be somewhat intelligent and he began teaching a few of them about history and literature, and also taught them how to read. The Szarlik went on to read books and one of the Szarlik named Rekkil read about slave uprisings and began to tell the other soldiers who named Rekkil their general, but Rekkil didn't begin the uprising just yet. Unlak talked a weapon smith into teaching them to make their own weapons, in case they had to. Little did Unlak or the rest of the clansmen know, Rekkil and his kin were going to use the knowledge given to them to turn on their masters years later when the Szarlik "army" grew and were taught everything Akul wanted them to know and their training was complete the clan was on the verge of making their move but instead Rekkil, who was gaining more support from his kin, led an uprising, killing all the clansmen and taking over the land in the name of Rekkil, who was named king of the Szarlik. physical description: (for males) Large and heavily muscled, average height for a Szarlik male ranges between 7'0-9'0 tall, their weight ranges between 300-600 lbs., and they have four arms. The two uppermost arms have talon-like claws and the lower set are long. The szarlik have razor-sharp teeth and eyes as black as coal. They have human-like faces except the jaws are considerable larger. They have grayish skin and hair colors ranging from black, blond, brown, and some are naturally bald. 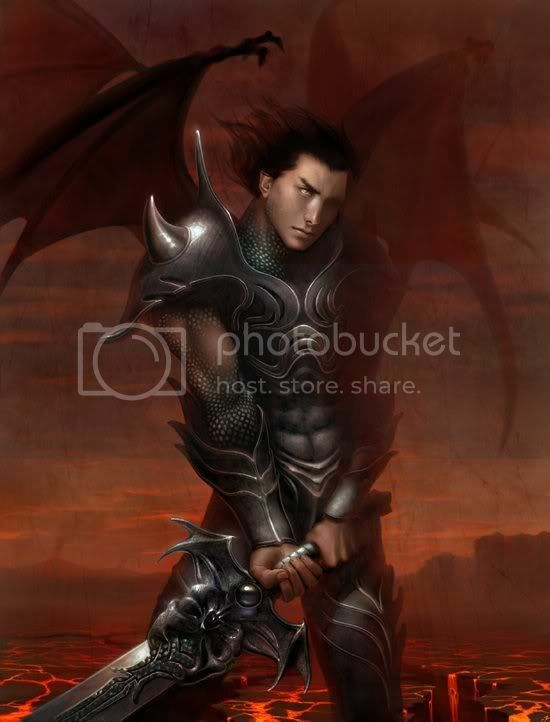 Abilities:(male) Very basic magics, rely on physical strength and fighting skill to defeat enemies. Szarlik are very strategic when they go to war, adept at smithing and building. Physical description:(female) Females of the Szarlik race also have four arms and grayish skin but they are small and slender. Their height ranges from 5'0-6'0 tall and they weigh between 90-160 lbs. They have the same hair colors and coal black eyes as the males. Abilities:(female) Make adept assassins and spies and can excrete a very lethal natural poison. NOTE: Do not make your character god-like. They must have reasonable weaknesses. 2007-05-18 [Cupboard*Full*O f*Malice]: lol okie,wonder if we`ll be seeingany szarlik any time soon? 2011-11-20 [ancienteye]: What race could have a sort of skeletal looking tail made of metal with an arrowhead-shaped blade at the end of it? Possibly a prosthetic to replace a destroyed tail? I think THAT would be fun to use in battles.